EYEPRIM™ is a sampling medical device for the collection of conjunctival cells from the ocular surface of the eye, for the purpose of analysis. EYEPRIM™ is the first validated and reliable tool addressing the sampling method traditionally called impression cytology, or conjunctival impression. From an original idea of professor Baudouin (M.D., professor and chair of ophthalmology, Quinze-Vingts Hospital), EYEPRIM™ solves all the issues related to this sampling technique and provides great sampling performances, in a reliable, reproducible, and user-independent manner. 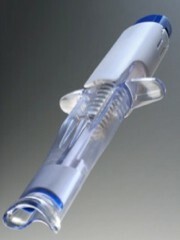 Very easy to use, EYEPRIM™ is provided sterile and does not need local anaesthesia. 1. Patient preparation: The patient must look up or down according to the selected sampling area. 3. Press gently on the push-button until reaching the stop. Hold from 2 to 3 seconds. 4. 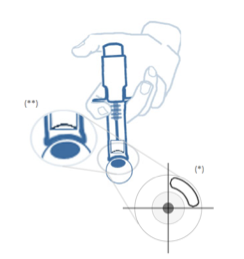 Release the pressure before removing the device from the eye, in order to protect the sample from environment. 5. Eject the membrane in a storage container by pushing hard onto the push-button. EYEPRIM™ is used by any organization – Contract Research Organizations, academic or private research centres, pharmaceutical companies – interested in improving the bio-molecular analysis of the ocular surface with a reliable sampling tool. EYEPRIM™ is also used in routine clinical practice by ophthalmologists to sample the conjunctiva of patients in order to refine the diagnosis of their ocular surface with further analysis. Classical Cytology analysis is possible with a suitable microscope after proper staining of the membrane. 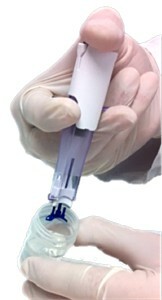 EYEPRIM™ sampling membrane is compatible with most staining techniques. Note: the membrane cannot be made transparent but powerful transmitted light can go through the membrane. You can also use reflected light microscopy. Visualisation of mucins and epithelial cells on conjunctival impression specimen collected with EYEPRIM™ on a healthy subject. Picture from ARVO poster 2014, Colligris et al. Cells collected with EYEPRIM™ can be analysed by flow cytometry once the cells have been detached from the membrane. 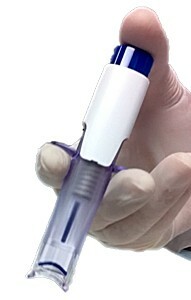 A single EYEPRIM™ membrane is sufficient for such measurement. Measurement of HLA-DR by flow cytometry on conjunctival cells sampled with EYEPRIM™. EYEPRIM™ has especially great yield performances for ribonucleic acids (RNA) and allows the measurement of several biomarkers from a single membrane. EYEPRIM™ provides great protein recovery performances. Particular attention should be paid on the choice of extraction buffer depending on the analysis to be perform. DIGE Buffer is particularly suitable for 2D-PAGE proteomic mapping. Softer buffer should be preferred for protein immunodetection. Spot detection on proteomic map corresponding to 2D-PAGE of conjunctival tissue obtained using EYEPRIM device. Picture from ARVO poster 2014, Roy et al. 3D cytology is a patented analysis method (OcuPharm Diagnostics) for the study of goblet cells and goblet cells secretions. This technique is performed on EYEPRIM™ conjunctival impression sample, using a Laser Scanning Microscope. Mucin and its mucin cloud from a muco-deficient (left) and a healthy patient (right). Observation by 3D-Cytology. Pictures from ARVO poster 2014. Colligris et al. EYEPRIM™ allows very fast, virtually painless, and minimally invasive cell collection from the living eye. Optimized sampling for bioassay analysis. “Up to 10 genes measurable by PCR with a single sample.” Steve Pflugfelder, MD. “300 ng of purified RNA on average from a single membrane.” Immunosearch. “EYEPRIM™ collects between 500 ng and 3000 ng of purified RNA per membrane”. (Data from 126 membranes.) Clinical study, undisclosed source. “Enough cells in a single sample for the measurement of at least one biomarker (flow cytometry). Very encouraging! One membrane is sufficient instead of 3 sometimes with the classic sampling method.” Francoise Brignole-Baudouin. Is there any container supplied with EYEPRIM™ for sample recovery? How do I deliver the samples to analytical centres? There are laws about the transport of biological samples. OPIA Technologies can provide you advices on this subject. Contact us at: contact@opiatech.com. What kind of reagent can I use in order to conserve the sample if I can't do the analysis immediately? The proper reagent depends on the kind of analysis that you are planning to perform on the sample. For RNA conservation, a RNase-free stabilization reagent shall be used. For DNA conservation, you should choose a DNase-free stabilization reagent. The cells integrity is not a criterion for those kinds of analyses. For flow cytometry and cytology methods however, the main criterion is the preservation of the cells integrity. PFA like reagents or methanol / water based solution shall be used for such analysis. OPIA Technologies can provide you advices on this subject. Contact us at: contact@opiatech.com. How long can I preserve the sample before to analyse it? Preservation depends on the kind of reagent used and the temperature conditions. Some reagent can preserve the sample at ambient temperature up to one week. OPIA Technologies can provide you advices on this subject. Contact us at: contact@opiatech.com. Where can I analyse my sample? If you do not have the resources or equipment required to perform the analyses, we can put you in touch with some laboratories in Europe and US that can perform it for you. Contact us at: contact@opiatech.com. What kind of membrane is inserted in the EYEPRIM™? The membrane is made of polysulfone. It is optimized for bioassay. Can the membrane be made transparent? The membrane cannot be made transparent. Can I do cytology analysis with the EYEPRIM™? 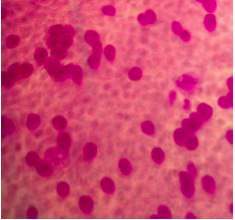 Classical Cytology analysis is possible with a suitable microscope after proper staining of the membrane. The membrane cannot be made transparent. Are there other sampling shapes available? For the time being, only one sampling shape is available. EYEPRIM™ was designed to match all patient ocular surfaces from 3 years old. Are there other kinds of membrane available? For the time being, only one sampling material is available. The membrane is made of polysulfone. It is optimized for bioassay. The collection of cells with EYEPRIM™ is quasi painless and can be performed without local anaesthesia. Is topical anaesthesia required before sampling? Can I be supplied with product samples? In France, a diagnostic impression on the conjunctiva is a refundable act at the price of 19,20 euros. CODE CCAM: BCHP001. You can purchase EYEPRIM™ on this website using the Order Online procedure below. You can also contact us directly at: sales@opiatech.com. Evaluation of Membrane Material for Impression Cytology. Roy P (a), Cimbolini N (b), Feraille L (b), Kechad M (b) and Elena PP (b). ARVO meeting 2011; Fort Lauderdale, FL – USA. ARVO e-abstract No. 1937 – Poster D918. Assessment of a New Device for Conjunctival Impression. Roy P (a), Cimbolini N (b), Antonelli S (b), Feraille L (b), Elena PP (b) and Baudouin C (c). ARVO meeting 2012; Fort Lauderdale, FL – USA. ARVO e-abstract No. 1868 – Poster A331. Assessment of the Eyeprim Device for Conjunctival Impression and PCR. Roy P (a), Groux H (b), Cottrez F (b) and Protat L (a). Invest Ophthalmol Vis Sci 2013;54: E-Abstract 5444. Invest Ophthalmol Vis Sci 2013;54: E-Abstract 5430. Invest Ophthalmol Vis Sci 2014;55: E-Abstract 2763. 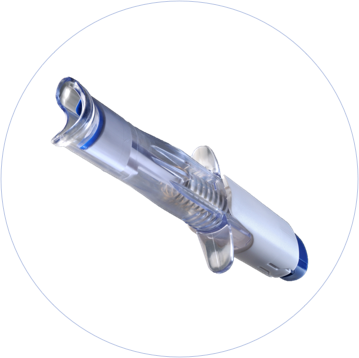 Founded in January 2010 and based at the Vision Institute in Paris, OPIA Technologies is a company dedicated to the development of an innovative portfolio of medical devices for the ocular surface. Our aim is to provide innovative and reliable sampling tools in order to further introduce the bio-molecular analysis of the ocular surface and to improve the care of patients with ocular surface diseases. The first product developed by OPIA is EYEPRIM™, a device to perform conjunctival impressions of the living eye, enabling further analysis of cells and biomarkers to help diagnose several ocular surface disorders such as dry eye, allergies or infections. Opia meets the highest level of regulatory requirements with a quality assurance system certified ISO 13485. Your delivery country is not in Europe ?